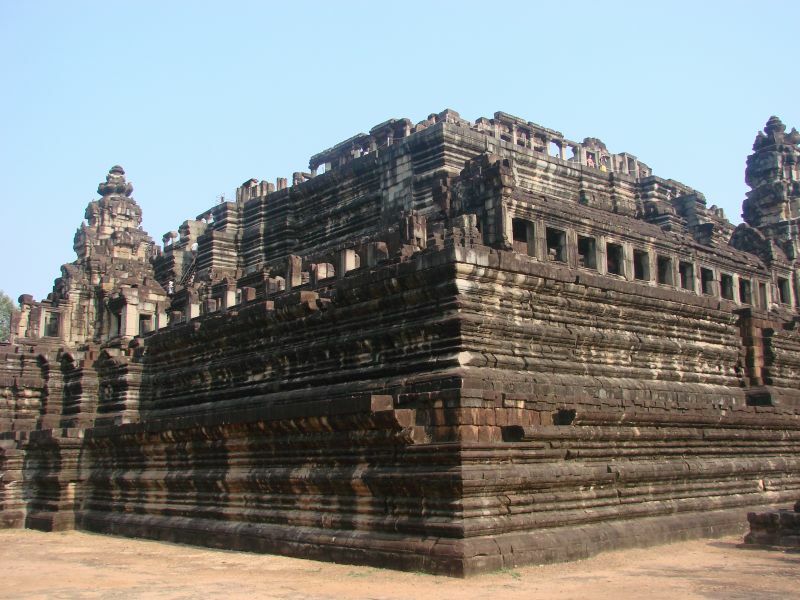 For many people the first thing that comes to mind when they thing of Cambodia is Angkor Wat, one of the largest temple complexes in the world. And while visiting Ankor Wat was definitely a highlight of our 5 month trip, I did not find Cambodia an easy country to visit. Cambodia went through a very dark period in the 70’s when the Khmer Rouge was in charge and approximately 1/3 of the Cambodian population was killed. When traveling around Cambodia, you still feel the impact of the terrible Khmer Rouge regime on the country and it’s people. 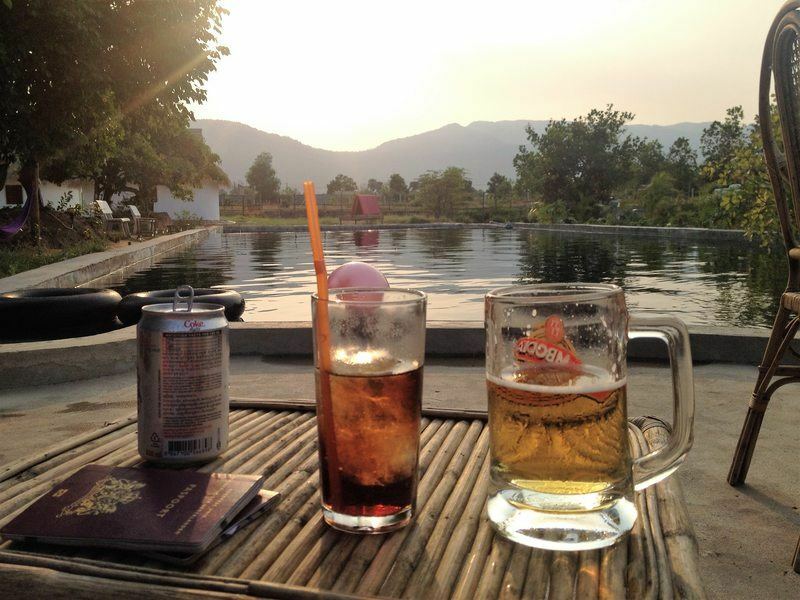 That being said, I did enjoy our time in Cambodia. Cambodians are very kind people, the food is delicious, getting around is easy (distances are not too big) and there are plenty things to see and do. Which language is spoken in Cambodia? About 90% of the people in Cambodia speak Khmer. While French is also an official language not many Cambodians actually speak French. However, in most touristic places people know (basic) English. But even when someone doesn’t speak English, most Cambodians will go out of their way to help you anyway! While the official Cambodian currency is the Riel, most tourists use US dollars. For payments smaller than $1 you’ll get change back in Cambodian Riel ($1 is 4000 riel). On this website you can find the current exchange rates. Cambodia has two distinct seasons, a dry and a rainy season. 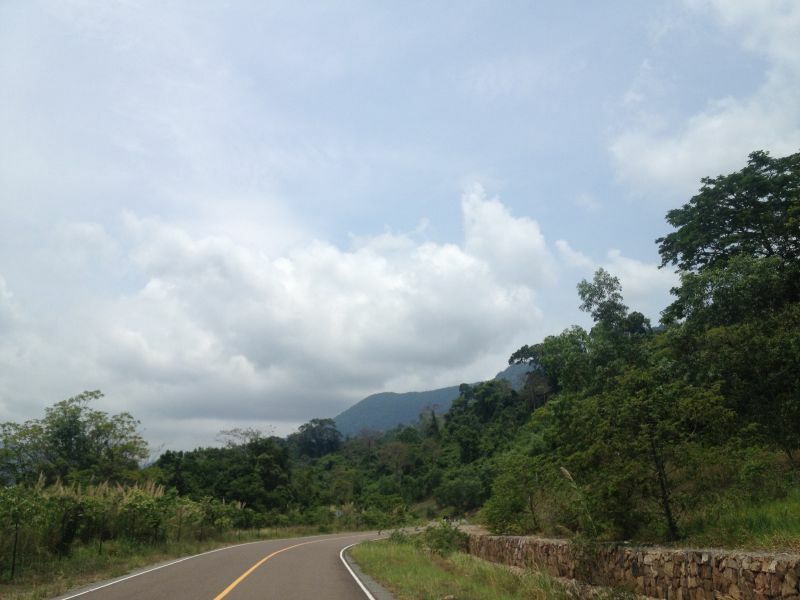 The best time to go is during the dry season, this runs from November until April. We visited in April and while Cambodia is pretty warm all year, April is generally the hottest month. How much money do you need a day in Cambodia? 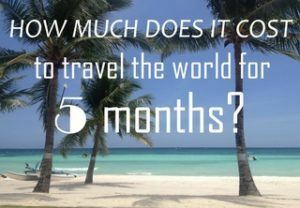 The short answer is: around $70 a day as a couple if you plan on following this itinerary. This budget covers accommodation, transport, food and drinks and costs for activities. As always, if you travel more slowly average daily costs will be lower. If you want to know more about the costs of traveling in Cambodia, check out my Cambodia budget post! What should I wear in Cambodia? As in many countries in Southeast Asia you should dress modestly. For women this means not wearing any tops that reveal too much cleavage or stomach, plus no miniskirts, hot-pants, yoga pants or other tight clothing. I always bring a scarf so I can cover up in temples, stay warm in a heavily air-conditioned van or shopping mall and plenty other occasions. For men appropriate attire is a blouse or shirt. Shorts are fine, though local men almost always wear long pants. Do I need vaccinations when traveling to Cambodia? Yes you do (quite a lot actually). The WHO recommends vaccinations for hepatitis A and B, the MMR (measles, mumps and rubella), the Tdap (tetanus, diphtheria and pertussis), yellow fever, cholera, Japanese encephalitis, typhoid, rabies, polio, meningitis, chickenpox, pneumonia and influenza. It is a cliche but still very much true: travel is as much about the destination as about the journey itself. That’s one of the main reasons I write my itinerary posts, getting from A to B is such a major part of travel! And also because in every country I visited, something unexpected happened when I was moving from one place to another. Like that time in the Philippines, when I waited 3 hours for a bus to El Nido. Or when I was in Thailand and boarded a train without a locomotive. Or Malaysia, where I got to Kuala Lumpur in one smooth journey without booking anything beforehand. 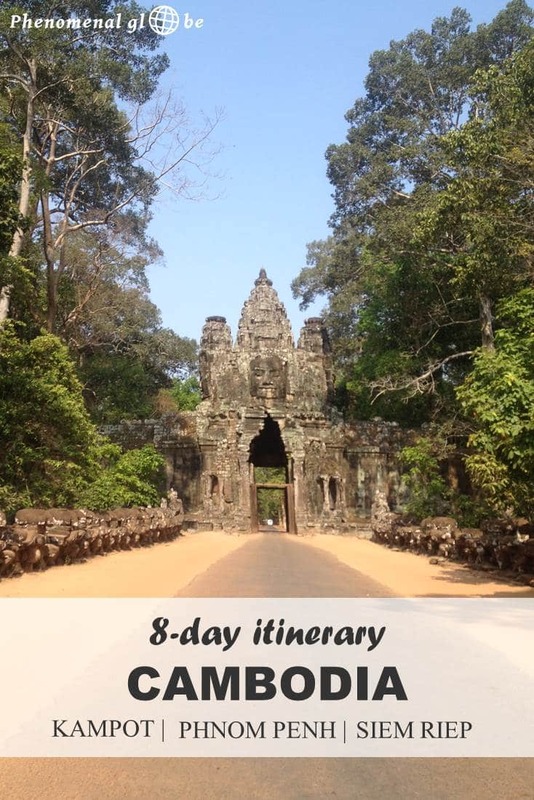 But I digress, let me share with you my 8-day Cambodia itinerary. Well, 9 if you count the day I spent trying to get across the Thai border the Sunday after Khmer New Year. Bad decision, very bad decision! More about that further on in the post. In the map below you can find our Cambodia itinerary, accommodations and the highlights we visited during our trip. 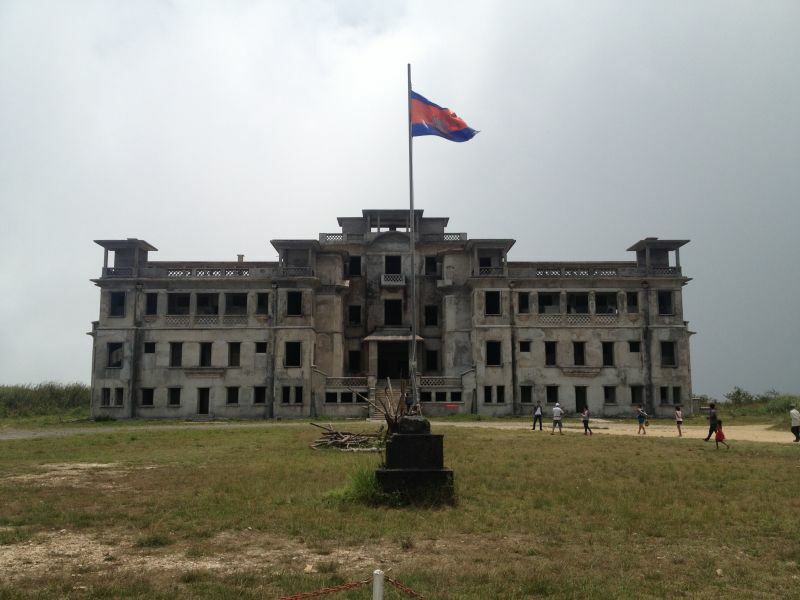 My husband and I entered Cambodia at Prek Chak, after spending an awesome month in Vietnam. On Phu Quoc island I bought a package which included transport to Kampot city center and the whole journey was a very smooth one! In Kampot city center we had a late lunch at the Epic Arts Café, a wonderful cafe serving delicious food whilst providing work opportunities for deaf and disabled people. After an epic lunch we hopped into a tuktuk that took us to Bohemiaz resort, one of my favorite hotels of our 5 month trip. I loved this place! Gorgeous view of the mountains while you are swimming or relaxing in one of the super comfy chairs or hammocks. The pool is excellent, no chemicals are used and it is cleaned naturally (with algae). The British owners, Brian and Michelle, really make you feel at home and are very helpful! They helped us arrange our motorbike rental, the bus to Phnom Penh and transport to Kampot city center. Bohemiaz resort is also a great place to meet other travelers and expats. And the food is delicious! The menu is a mix between Western and Khmer dishes, good prices and large portions. 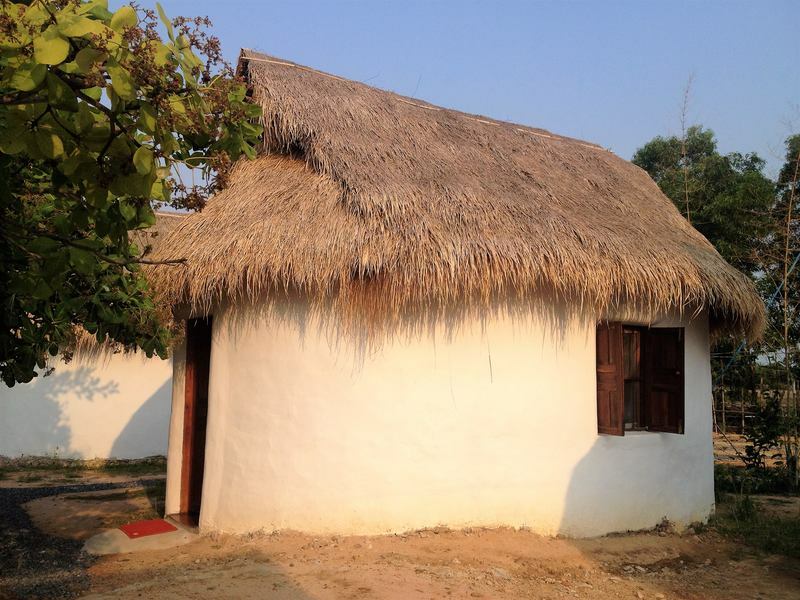 We stayed in a bungalow for 2 nights and 1 night in the budget room. Both were clean, comfortable and great value for money. The next day we rented a scooter at the supermarket across our hotel and explored Bokor Hill Station, an abandoned ghost town located on a 1000 meter high mountain. We kept the scooter another day and drove to Kep National Park to go hiking. The people from the Led Zep cafe work tirelessly to maintain the 8km jungle track they created. It’s was nice hike and the bright yellow signs made it impossible to get lost. Nevertheless, the views were great, we could see Kep village, the ocean and in the distance even Vietnam, where we spent a full month! Michelle, the very friendly and helpful owner of Bohemiaz, booked tickets for us on the Giant Ibis bus to Phnom Penh. I was pretty happy there was any transportation available at all since it was Khmer New Year and lots of things were closed. Giant Ibis was one of the better bus companies I traveled with in Southeast Asia. The bus left on time, didn’t stop along the way and was quite new. Also, it had air conditioning which wasn’t on the highest (aka freezing) setting! Altogether a comfortable 3 hour drive to Phnom Penh, where we were dropped off at Giant Ibis bus terminal, across the night market. Our hotel, was within walking distance (15 minutes or so on foot) and located across the Royal Palace. Unfortunately the Palace was closed because of Khmer New Year during our entire stay in Phnom Penh. In Phnom Penh we stayed at the Diamond Palace II. It was a nice place, comfortable bed and we could make tea in our room with the small water cooker. Free mineral water provided and even a small fridge in the room to keep our water cool. The staff was friendly and helpful and arranged a scooter for us costing $7 for a day. 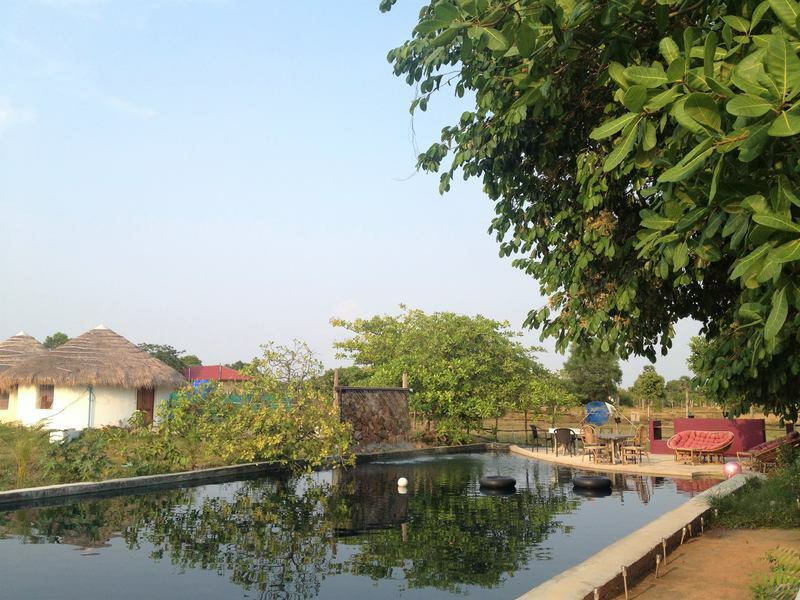 Good place to stay a couple of days while you are exploring Phnom Penh! The streets were still empty because of Khmer New Year so we rented a scooter via our hotel and drove to Choeung Ek ourselves. I don’t know how traffic usually is in Phnom Penh, but if it’s anything like all the other Asian cities I visited on regular days, I wouldn’t recommend hiring a scooter unless you are an excellent driver. That night we hopped on the Giant Ibis night bus to Siem Riep and the trip was fairly comfortable, nevertheless, I didn’t sleep so well. I just don’t sleep well on buses in general. The night train in Vietnam was much more comfortable and also a lot less bumpy (the road between Phnom Penh and Siem Riep isn’t good to say the least). Early in the morning we were dropped off at Giant Ibis bus terminal, located about 2-km from the city center of Siem Riep (learn more about Siem Riep and it’s history). Because we liked to stretch our legs after a night on the bus we walked to the center, had breakfast and were then picked up by a tuktuk from Overflow Guesthouse. Even though we couldn’t check into our room until the afternoon, I was very happy the hotel picked us up so early in the morning. We relaxed at the pool and later that day we cycled around Siem Riep on the complementary bikes of the hotel. Nice place to stay! At the hotel free mineral water provided and there was a beautiful pool which we used a lot. It was so hot when we were in Siem Riep (April 2015). The room was spacious with a comfortable bed and ok shower. The hotel staff was friendly and arranged our transport around Angkor Wat with a great tuktuk driver. Another excellent service are the free bikes, on the other hand, this is also kind of necessary since the hotel is located a bit out of town. That does make it a nice and quiet place to stay. The one thing I disliked didn’t have to do with the hotel itself but with the transportation to Thailand we booked via the hotel. It was supposed to be a direct bus but it was not… We were kicked out of the bus at the Cambodian border! Ah well, not the hotels fault, this happens all the time in Southeast Asia;-). You can buy a pass to the Angkor complex for 1 ($37), 3 ($62) or 7 ($72) days. A photo will be taken at the ticket booth and printed onto your entree pass. The ticket booth is located on the main road from Siem Riep to the Angkor Wat complex, not easy to miss. I recommend hiring a tuktuk to explore the huge complex and all the tuktuk drivers obviously know the drill. Our tuktuk driver, Mr. Sheara, was the best! We paid $22 for the entire day, including pick-up from our hotel at 4am to be on time for the stunning sunrise. Take lots of water with you, it gets very hot during the day! Take a scarf and wear proper clothing. It is a temple complex after all. Tip your tuktuk driver. They work hard and you can easily spare those couple of bucks. As effortless our way into Cambodia was, so difficult was our way out… It was actually our own fault. Looking back it was a terrible idea to try and cross the border the weekend after Khmer New Year. I have never seen so many people squished into a small hall. It took us 4 hours and had we not come up with a tactic to keep all the line cutting Cambodians behind us I would probably still be waiting in line. After an hour of sweating inside the hot building, where four Thai gentlemen were stoically stamping passports in a maddening slow fashion, we hadn’t moved an inch in line. Because as bad as Dutch people are in queuing, some Asian people are even worse (no offense;-). Looking back, I wish I had taken pictures as I now find it rather funny, but at that moment I took it very serious:-). Inch by inch we moved closer to the passport stamping Thai officials and 4 hours later we were finally through… I had a slight moment of panic because we didn’t have a ticket out of Thailand but nobody asked;-). We finally arrived in Bangkok around 10pm, more about our time in Thailand can be found here. 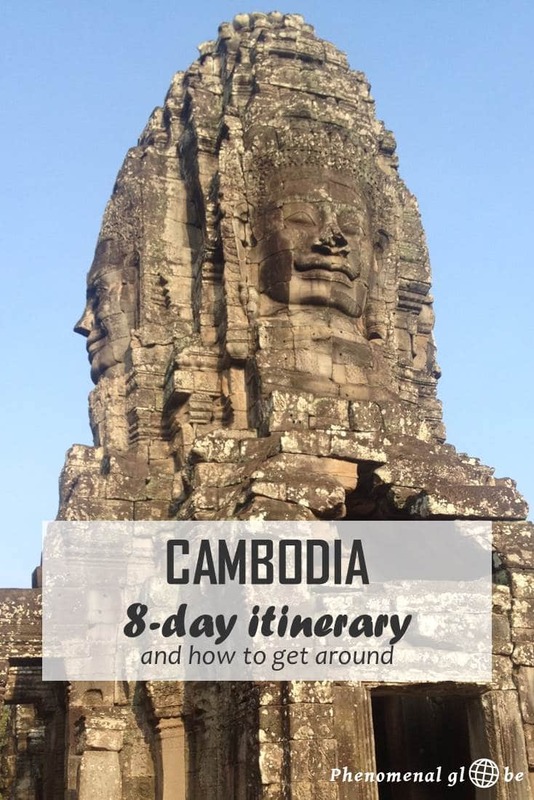 If you plan on going to Cambodia, I hope this itinerary and information helps you plan your trip! You can download it below. Let me know if you have any questions about our Cambodia itinerary! Perfect timing! We’re in Thailand now, but will be in Cambodia in a month or so, and haven’t even started planning where to go/what to do/what to see. Awesome! Happy to help:-) Enjoy your time in Thailand and let me know if you have any questions about the itinerary! Great itinerary! I’d love to go to Angkor Wat and Kep National Park. I just don’t understand why people can’t just queue. Get in line and wait your turn! Thanks Dana:-) Angkor Wat was very special and I loved hiking in Kep National Park, first time in my life I saw wild monkeys! Totally agree about queuing, Dutch people are not very good at it in general but I have learned a lot living in London for 4 months since the British practically invented queuing;-P. When I went to Wimbledon for the day tickets queue I received a 24 page ‘Guide To Queuing’, LOL! Very informative. I like how well structured and clean your itineraries are. Easy to read! I would love to visit Cambodia and (that part of Asia in fact) but still trying to get some time to do it. Anyway, we had a great time and I loved the Angkor Wat Temples! Oh that’s a pretty bad border crossing as well… Good for you guys for not paying the bribe! You itinerary is very detailed, thanks for that! It’s really helpful. P.S. If you don’t mind me asking, how did you embed the map? Haha yeah me too, at one point I just thought about giving up and staying in Cambodia;-) Glad you find the itinerary helpful! I make the map in Google My Maps and if you make it a public map you can embed it (click ‘share this map’ and than copy the embed code). Let me know if you need any help! This is a great detailed itinerary, makes it so easy to explore Cambodia. We missed going to Cambodia while we traveled S.E. Asia, we will have to go back and travel there soon. It’s a country with a very impressive history… Definitely worth a visit. Thanks for all the useful info Lotte…It’s great to see such a detailed itinerary to give me some trip planning ideas. Thanks Amanda:-) Enjoy your trip planning! Although enjoy may not be the right word, I did enjoy Choeung Ek a lot. It was very impressive and very open about what happened. It made me feel bad for the rest of the day! Love Cambodia. Thanks for the share. Always good to get to some places outside of Siem Reap, not knocking on Angkor Wat it’s incredible. Haha thanks Cameron. 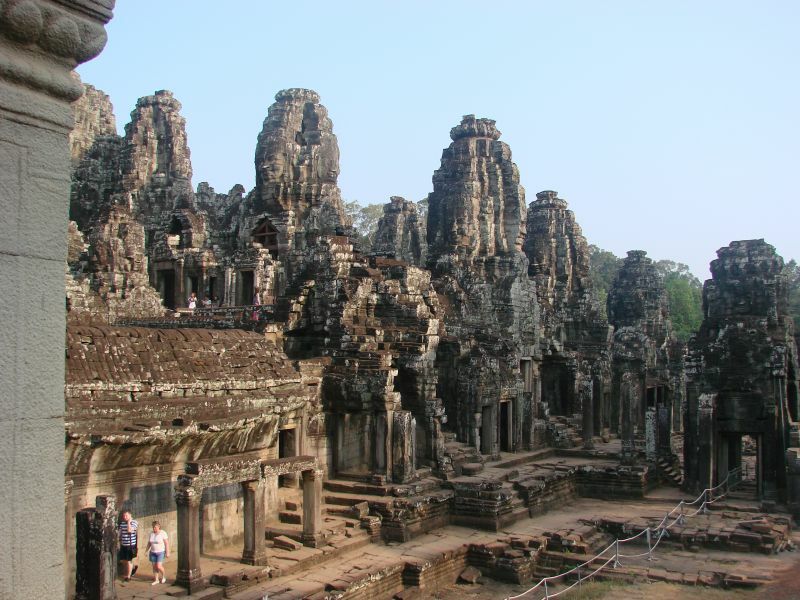 Agreed, Angkor is incredible but Cambodia has so much more to offer! This is so helpful! I’m planning a trip to Cambodia next March. How long was the Giant Ibis bus ride from Phnom Penh to Siem Reap? I’m planning to fly from USA to Phnom Penh and then back to the USA from Phnom Penh, but I want to make sure I give myself enough time to see Angkor Wat, too, and that means I need to account for how much time it’s going to take me to get there from Phnom Penh. Any help would be greatly appreciated! Hi Caitlin, so nice to hear from you and great you are planning a trip to Cambodia. The Giant Ibis bus from Phnom Penh to Siem Riep was a night bus. It left around 11pm and arrived early in the morning at Siem Riep (around 5am if I remember correctly). Taking a night bus saves you time (and money for accommodation), but I don’t skeep very well on a night bus so I am always a little tired after a night like that. Hope this helps, let me know if you have any other questions and have an amazing trip! Thanks, Lotte! I will definitely be sure to come to you if I have any more question. I always say that I have the magic ability to be able to sleep anywhere, BUT I’ve never been on a bumpy road in Asia, so we’ll see. Thank you such for your help! Very welcome:-). You can give it a try and see how it works out for you, if you can sleep on night buses it saves you lots of time!